I was impressed with how well the dogs were faring in India. I can't count the number of times we saw traffic divert itself because a dog was sleeping soundly in the street. Just like the cows, the dogs knew no harm would come to them. We believe even when a trip is over, the storytelling has just begun. As story tellers, we enjoy not only sharing the tales from trips taken just weeks ago but the ones completed years ago too. 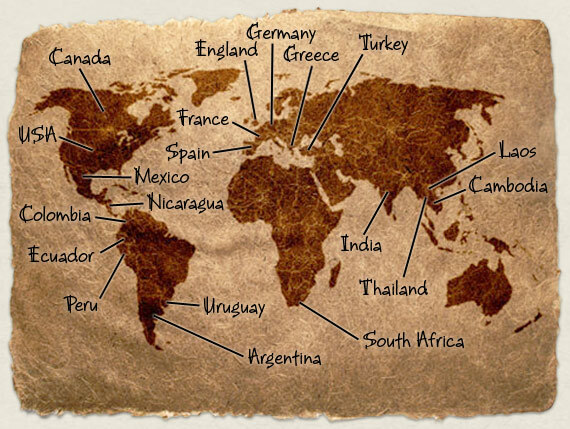 And as travel addicts, our goal is to visit several new countries (and return to a few favorites!) every year. I LOVE that cute little construction worker hedgehog! Where ever did you find him/her? Heh. That's Herbert the hedgehog, who runs things behind-the-scenes at the website. He scuttles back and forth, fetching entries for people and posting their comments for them, but he's very shy. Once he's finished this page, he'll probably go back into hiding. He'll always be here though, no worries. Keep your eyes peeled, and you might even spot him somewhere else from time to time. This is a great web-site! I just found out about it from my friend who recommended it for me. I can't wait to start traveling more myself. What a inspiring love story you two are! I wish you lots of love and continued joy and safe traveling! Hey Mikko! Thank you so much for stopping by! I'll confess your comment had both Tim and myself grinning from ear to ear this morning. So thank you for that too! hey you two, according to Google you have visited 8% of the world's countries…oh-so-not enough! Yes, ma'am. We'll see what we can do about that!